That his right arm may never be perfectly straight does not really concern Dugan Flanders. That it may be slightly shorter than his left arm doesn't really bother him. What he really wants, what he really cares about, is the use of his right arm. When faced with the functional loss of a limb, cosmetic issues fade in importance. That's why Dugan has had four metal pins and a titanium rod on his forearm this winter. Dugan Flaners underwent arm lengthening this winter. He broke his right arm five years ago and had it rebroken last fall, so his ulna could regrow to be the same length of his radius. Last fall, Dugan underwent a procedure to lengthen his ulna, one of two bones in the forearm. Basically, the procedure consisted of breaking the ulna in his right arm, stretching it, creating an inch and a quarter gap in the bone, and letting it heal. Dugan shattered his right arm five years ago, falling from a tree when he was a fourth grader. He and his dad, Mike, were cleaning up after a Homecoming toilet-papering. Dugan had climbed his favorite tree, a little maple in their front yard, and was trying to reach a piece of toilet paper when he fell, six feet or so, to the ground, breaking both bones in his right forearm in several places. At first, Dugan did not even realize he was hurt. But soon they realized his right arm and elbow were hurt and they rushed him to the hospital and then to St. Cloud. Dugan, his dad, and his mom, Jo, were all pleased with his initial treatment, with the job the doctors did to set his shattered arm, using eight pins. Even then, though, they were warned that Dugan would face additional health issues as he grew. The problem was that in shattering his arm Dugan had also damaged the growth plates on his ulna. He did have minor surgery three years ago at the Mayo Clinic in Rochester to try and remove some of the scar tissue and to get his ulna to grow. His right arm grew six or seven millimeters, then stopped. The doctors at the Mayo Clinic wanted to burn the growth plates in his radius, too, keeping his right arm functional, though stopping its growth. Mike and Jo wanted Dugan to have as much growth as possible, so they took him to a specialist in limb lengthening in the Twin Cities. This specialist focuses more on legs than arms, since having legs of the same length is important for walking and having legs of different lengths can lead to hip and back problems. Having arms that are not exactly the same length is something that you can live with, said Mike. As Dugan hit a growth spurt in 2002, the radius in his forearm started to grow while his ulna did not, causing his arm to twist and putting pressure on his elbow and wrist. His specialist wanted to wait as long as possible, to let his radius grow as much as it could, before trying to correct the disparity in length. "His arm worked pretty well," said Mike. "It looked weird, but it worked pretty well." So Dugan waited a year. The decision to make was how long to let his radius grow before trying to correct the length in his ulna. They wanted to get as much growth as possible - so his right arm would be as long as possible - but too much growth might have permanently injured his elbow or wrist, as his arm twisted. The question, Mike explained, was: How bad do we dare to let it get? Dugan, now a ninth grader, had surgery on his right arm last fall, after cross country finished. The specialist broke his ulna and inserted pins. The goal was to pull his ulna gradually apart, lengthening the bone as it healed . Unfortunately, Dugan's ulna was not completely broken, and it held. As a device, called an automater, tried to pull his ulna apart, a millimeter per day, his not-completely-broken ulna held. Displaying the strength of bones, instead of his ulna moving, the titanium rod of the automater started to bend. The automater was moving, said Dugan, but it was bending metal not bone. Two weeks after his first surgery, the specialist broke Dugan's arm again. This time, some fiber held his bones together, but five days later, his ulna did crack entirely, and Dugan experienced severe pain one night as a five-millimeter gap in his ulna opened at once. Bone (like paper) Dugan was told, is easy to break (tear) but tough to pull apart. Dugan wore the automater for about six weeks, until an inch and a quarter gap was created in his ulna. As the automater stretched his ulna, his arm got weaker and hurt more, Dugan said. "It ached a little bit here and there, but at first - when the gap wasn't very big and I could do anything - I didn't notice it," said Dugan. By Christmas, though, the pain was worse, added Dugan. By creating a gap, Dugan's ulna was lengthened by allowing it to heal and fill the gap with new bone. For Dugan, one of the biggest tasks was keeping the four pins fastened to his right arm clean. Because a bone infection would be so severe, Dugan had to wash the pins regularly - after every shower, for instance - and protect the pins with gauze. While Dugan might have preferred to have gotten out of all his household and horse chores, his only restriction was to avoid heavy lifting. If his arm hurt, he stopped, but he played boot hockey, helped around the house and in the barn this winter while his arm was healing, and now is preparing to run track this spring at school. At school, his right arm was weaker, but he still used it to write. He found he could not write as much though. 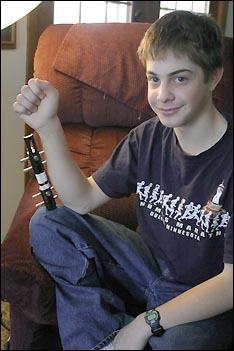 He experienced quite a lot of curiosity because of the device on his arm and quite a few references to his "bionic" arm. He also poked holes in quite a few shirts and sweaters with the four pins sticking out of his arm. When Dugan gets the pins out of his arm in April, all that should be left is to let the four holes for the pins heal. He'll have to wear a splint for a few weeks, but then he should be healthy. He won't be too concerned that his right arm won't be perfectly straight. He'll be glad it works.